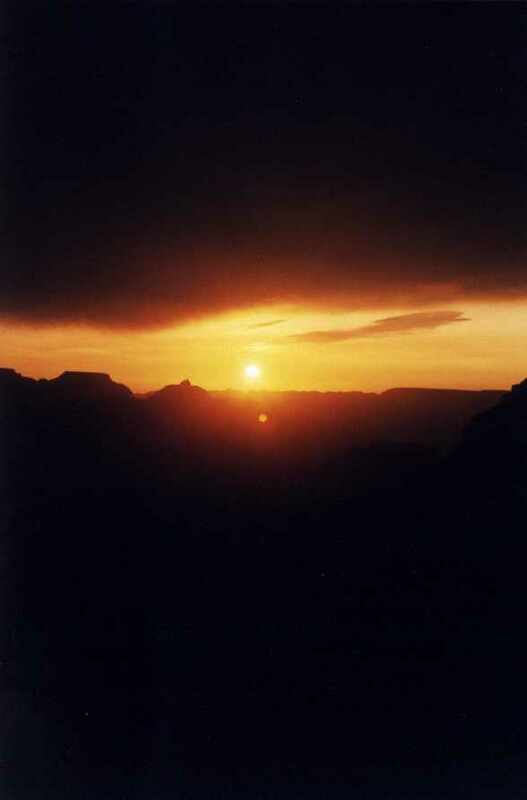 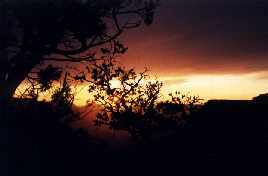 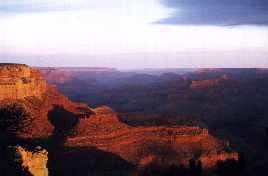 It being our last day at the Canyon, we intended to get up early and see the sunrise. However, we were still apparently in "sleep-in" mode. We got up early enough to see the colors, though, and got out to Yavapai Point soon enough to see the clouds and colors of a very spectacular sunrise. After breakfast, we were on the road. 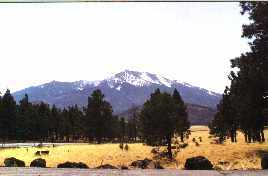 The first quick stop we made was near Humphrey Peak at an outlook on the highway. We thought the snow on the mountain was really something at the time, but we had no idea what was to come later. 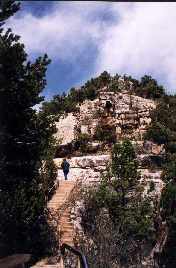 Our next stop on the trip was in Walnut Canyon. 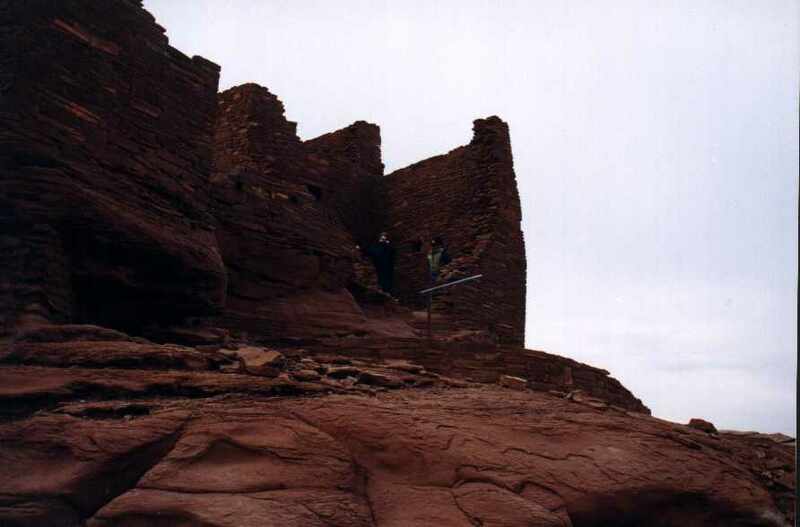 This is the site of some indian cliff dwelling ruins. 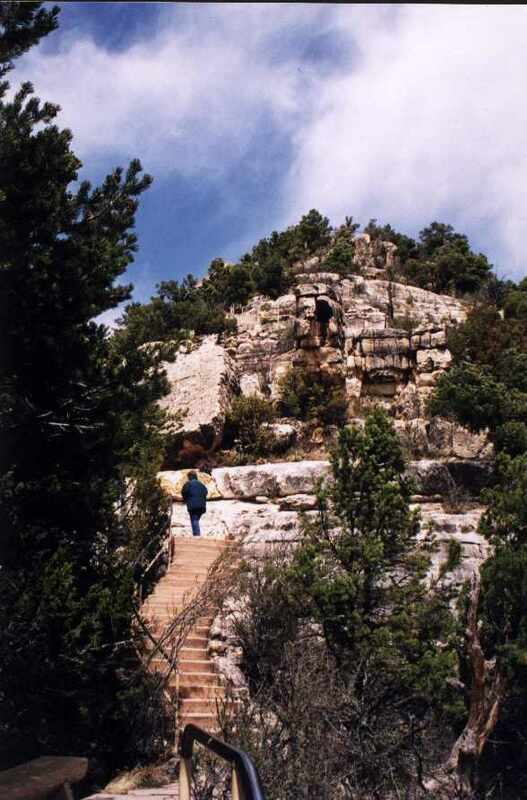 It is quite a climb down, and the wind was fierce (of course, the "climb" was on well-maintained concrete stairs, but the climb back up was a long and tiring one just the same). 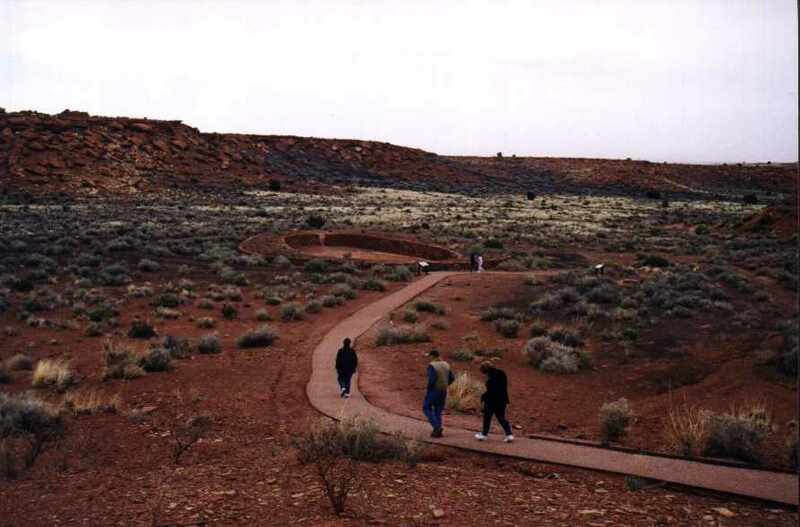 This first photo was taken from the Ruins area over toward the Visitor's Center (you can see some more ruins near the bottom of the picture). The second photo is the stairway back up (you can just see part of the roof of the Visitor's Center in the photo) . 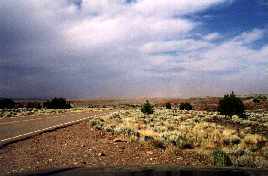 Once we reached Flagstaff, we wanted to go East and see a few landmarks, but unfortunately the wind had shut down I-40 Eastbound (apparently, it had blown a couple of empy 18-wheelers on their sides and blocked the highway). We decided to check into our hotel room and head back North a bit for a little touring there. 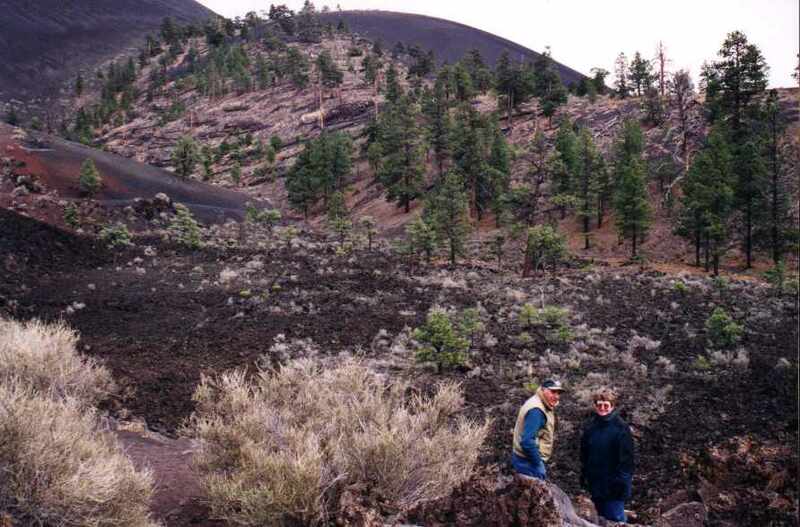 Continuing with our National Monument Tour, we went to Sunset Crater. 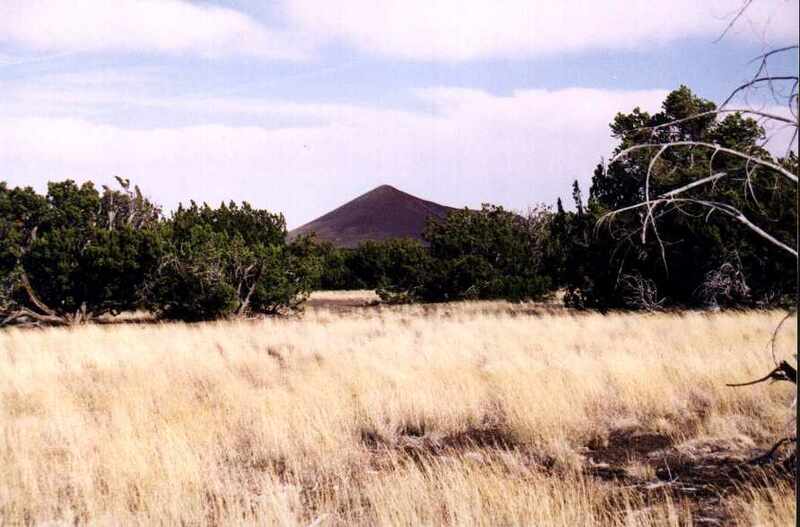 This is a large volcanic mountain that is bright red in the right light (in fact, in very good light, is supposedly looks like it is on fire at sunset). 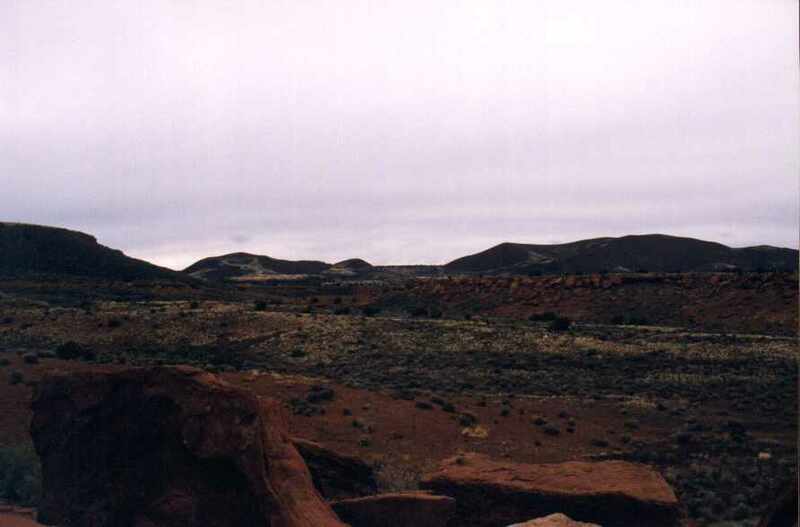 The light was not very good the day we went, and the wind was incredible (we all got a little sandblasted from time to time), but the mountain was a beautiful red color anyway, alternating with black. 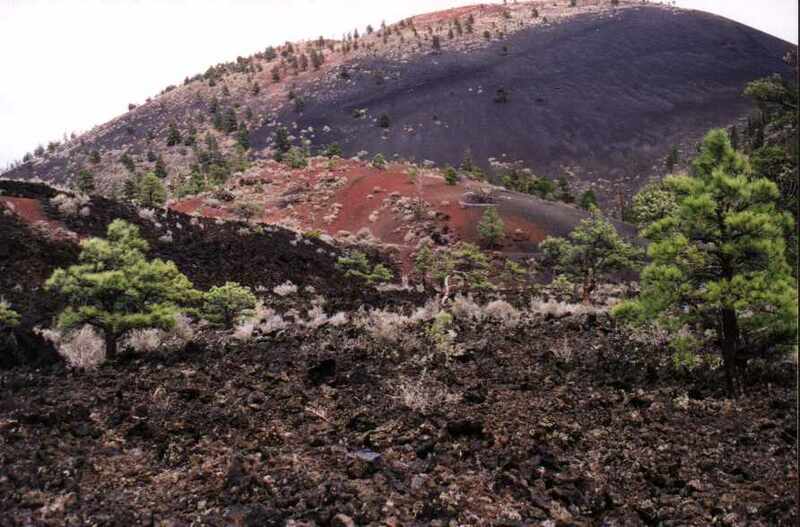 These are some various views of the Sunset Crater. 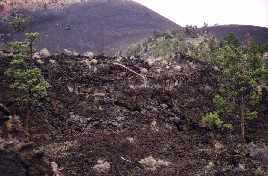 Sunset Crater is located in an area that is full of broken lava. It is a "recent" volcano (about 1 million years since the last eruption), so the lava is not very eroded. 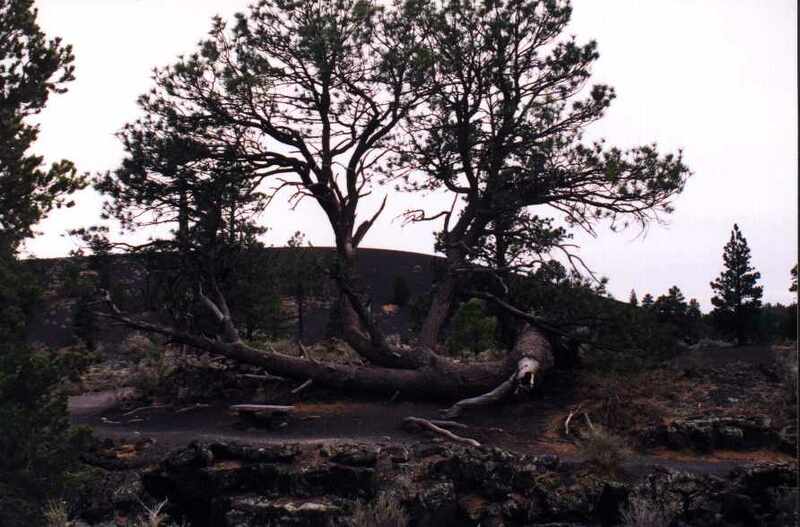 Lava is also not very firm soil, so the plants that have grown tend to be small, or very hardy, like the tree in this picture. At the base of Sunset Crater, there is a fairly extensive set of trails leading through the old lava flows. We walked these for a while, but the wind forced us back to the safety of the car after a little while. 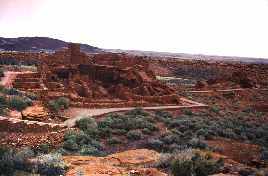 Just north of Sunset Crater, there is the Wupatki Ruin National Monument, which contains 2 Indian ruins. 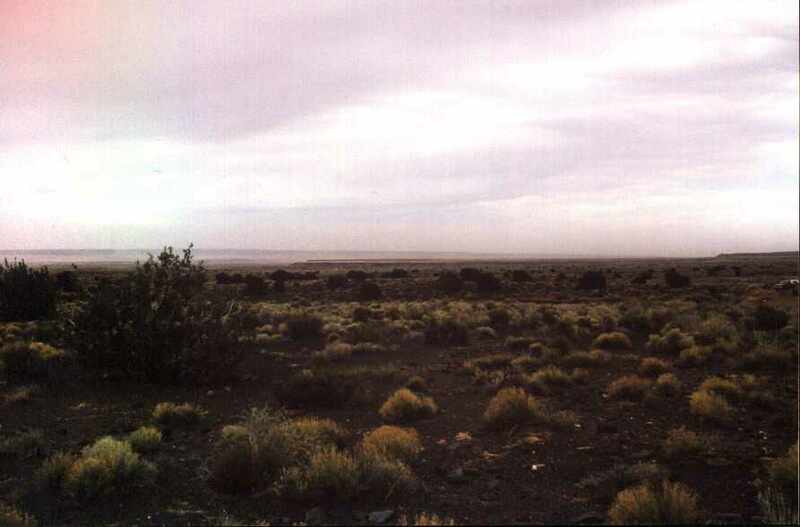 The road between them has some really spectacular desert views. We did not get many pictures of this because the wind was just too fierce to get out of the car often. In fact, this photo was taken from inside the car looking out the windshield (at the bottom, you can just see the hood of the car). 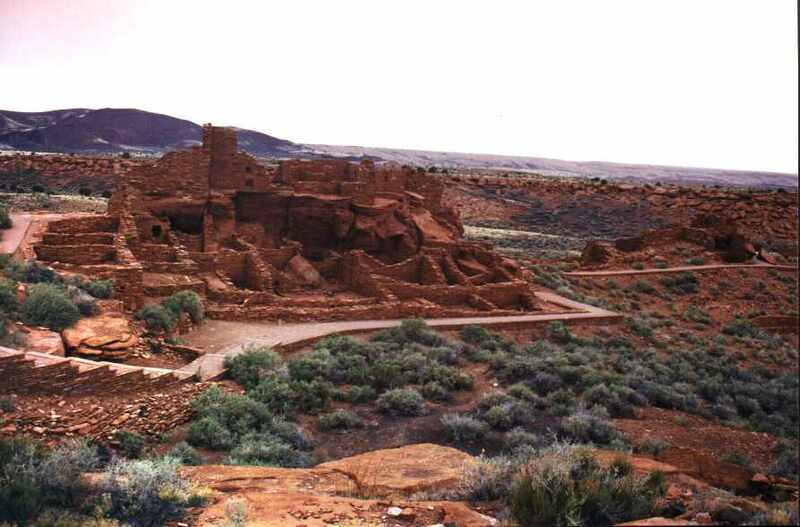 The first Indian ruin we saw was called Wukoki (The Big House). 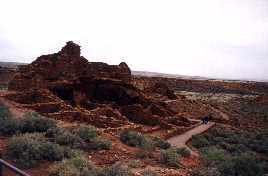 The second ruin was called Wupatki (The Tall House). 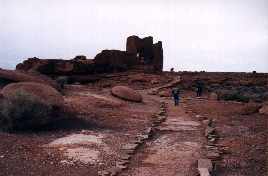 This is a pretty extensive ruins site, with an intact ball court (last picture) and a number of other structures. The road from Wupatki continues North for a while, then meets back with 89A. 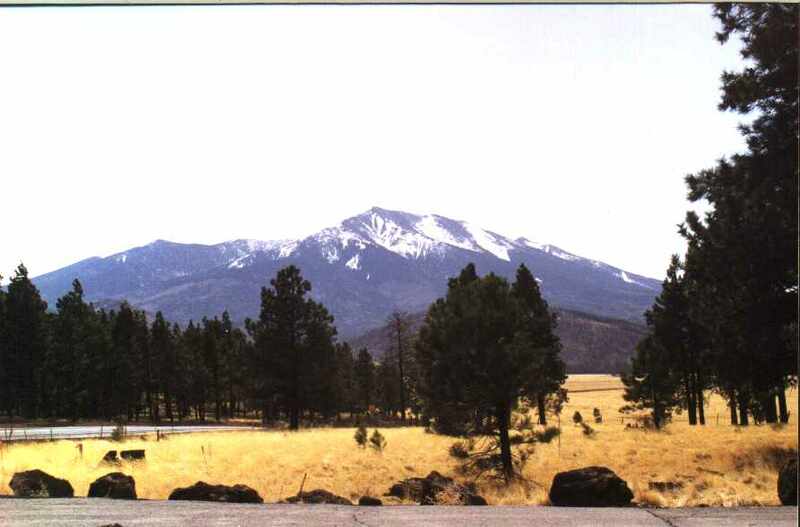 We decided, however, to drive back down via Sunset Crater to save time and gas, since it was about 5:30 and we were all getting a little hungry. 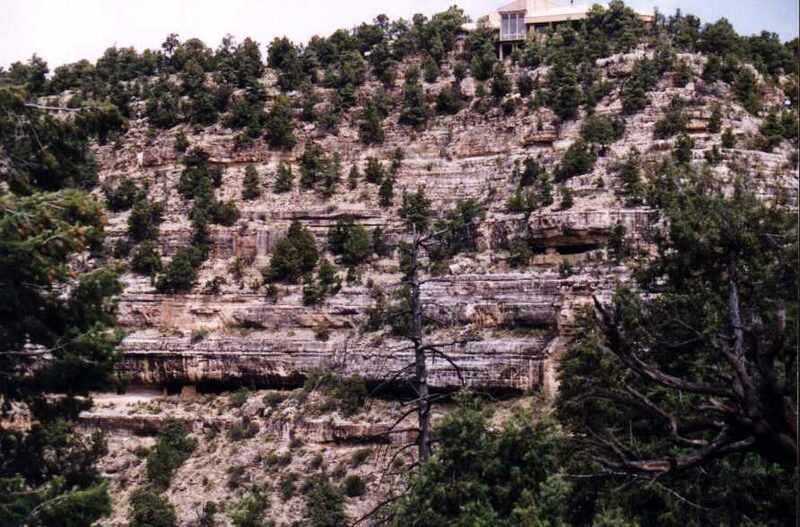 The road isn't that long (maybe 20 miles or so), but it is amazing how much the vegetation changes during that drive. 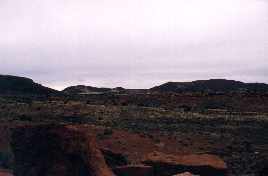 The area around Wupatki is red earth and small desert plants. 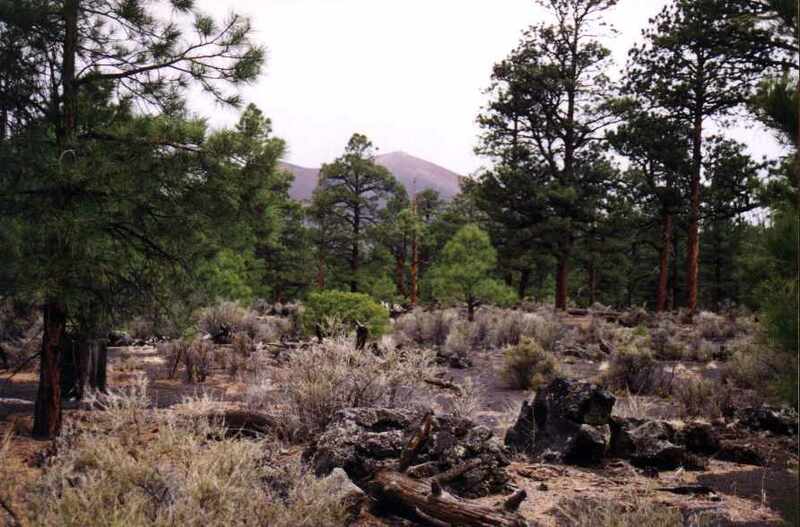 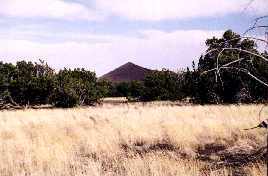 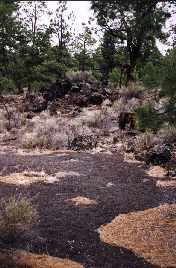 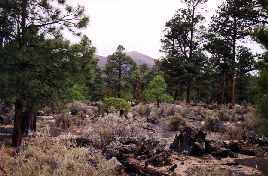 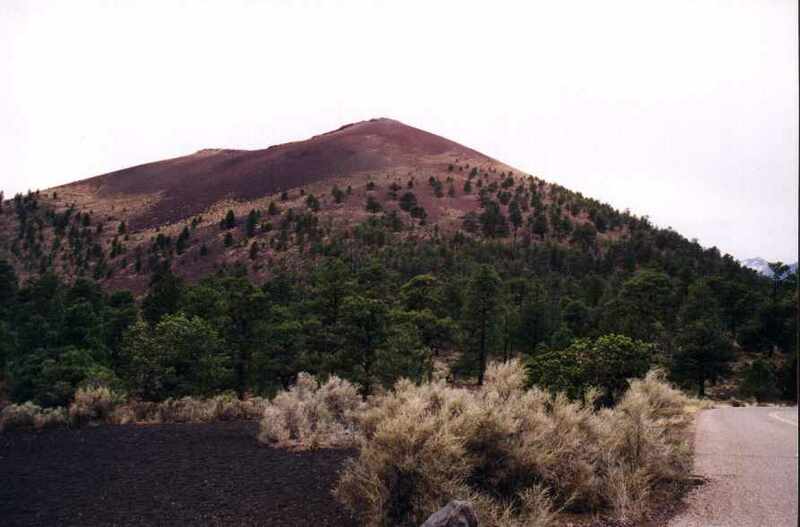 Sunset Crater's area is primarily evergreen trees, a few desert plants, and sandy lava earth.